The greater proportion of cars here in Qatar are large or very large. The Toyota Landcruiser is the preferred mode of transport for many Qataris, that is if they’re not driving the large Lexus, Porsche Cayenne or the Nissan Patrol. There are also large numbers of Hummers. The slightly more compact SUVs and large saloons make up the bulk of the rest of the non commercial traffic. My 2 litre sized engine is fairly modest by local standards. 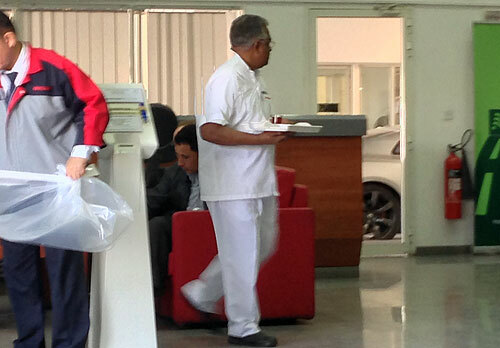 Even the smaller hatchbacks in Qatar have 1.8 litre engines. A person in the west driving a V8 with a 5.7 litre engine would be considered on par with a child killer, but here it’s normal. 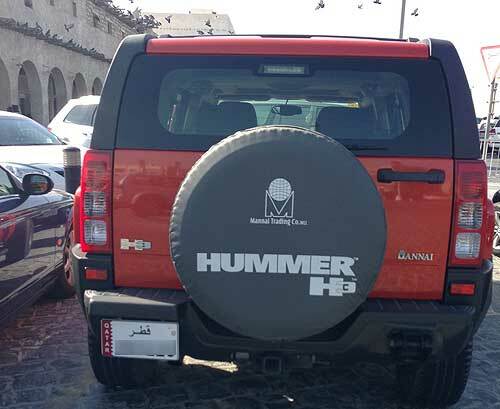 I have seen no evidence of hybrid cars on the roads in Doha… I guess that with petrol at 17p per litre, even driving a Hummer which gets only 10 miles per gallon is still going to cheaper to run than driving a Prius most anywhere in the west. 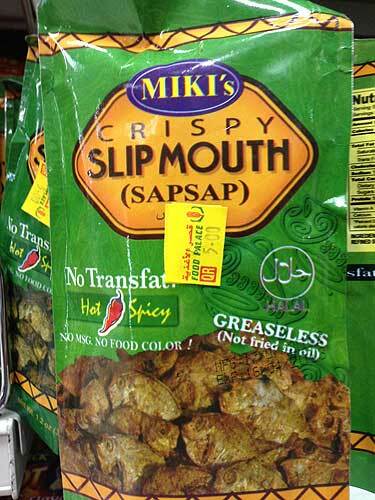 On the shelves at the Food Palace are Miki’s Crispy Greaseless SlipMouth, a popular snack imported from the Philippines. It comes in plain or hot and spicy at about 85p a pack. 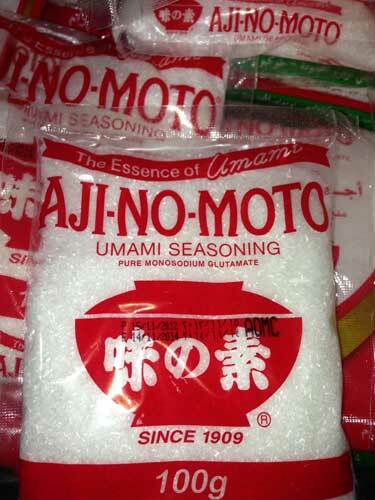 It is, as the packet says, greaseless and contains no transfat with no MSG or food colouring. Sounds good to me until you find out that Slipmouth is a fish. It is also known as Sapsap which are ‘small slimy-bodied percoid fishes (genus Leiognathus)’. If, however, you feel your Slipmouth, or indeed any of your food is short of flavouring and added chemicals, you can also add your own MSG. 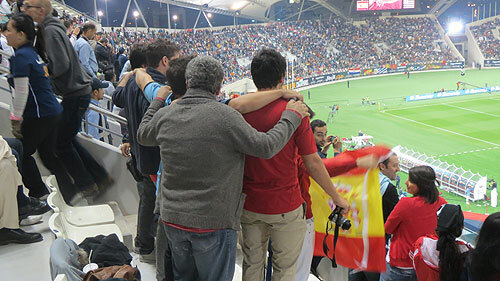 Yesterday we went to our second major sporting event… the semi finals of the Qatar Open Tennis. For 75QR (£13), we got seats overlooking the net. I have never been to a professional tennis match. I am not a tennis fan… I guess I lost interest after the era of Borg and McEnroe. We chose to go to the semis because it involved the four top seeded players.There were three matches that day starting with the women’s doubles followed by the two semi finals of the women’s singles. We arrived mid way through the doubles to make sure we got a good location, as seating was unallocated. I had not heard of any of the four players in the doubles. As the match progressed I silently rooted for the Italians because they had, at least, made the effort to wear identical clothing… and they triumphed. There was a 30 minute break for the first of the semi finals between two players I had also never heard of. It perhaps shows that I am not a follower as Victoria Azarenka is ranked number one in world and Agnieszka Radwanksa is at number four. Azarenka is known for the odd noise she make when hitting every ball. It is hard to describe the sound but it’s a sort of singing whoooooooo. It is quite an interesting sound for the first few times, but after hearing it, at a guess, over 800 times during the match it becomes slightly annoying. The match was good but never very exciting. Radwanksa lost the match. At the end of each match the winner hit several ball into the crowd. The resulting scramble for an ordinary tennis ball amongst grown men was surprising. I was particularly impressed by the professionalism of the ball boys who ran back and forth to collect balls without getting in the way of the players. I remember as a youngish child wanting to be a ball boy at Wimbledon. But I knew that they only used boys from Dr Barnados homes, and having to be an orphan seemed unfair as it wasn’t my fault I had parents. If only there had been a Court of Human Rights when I was a boy, I am sure I would have had a good case. The match we had been waiting to see was Sharapova against Serena Williams. It was not a disappointment being a much more exciting match, in what I believe is described as serve and volley. They spent most of the time outside the borders of the court smashing the ball back and forth. The fastest serve was 187kph by Williams who won the match. Serena was my choice to win… it maybe a hangover from the cold war but I found I couldn’t root for the Russian. It was all a great spectacle but there was a sense of watching people with OCD. Players repeatedly took three balls when getting ready to serve, but hit one back to the ball boy each time. As far as I know each tennis ball is exactly the same, but for some reason they had to make a choice. In the doubles the partners ‘low-fived’ after every point. Sharapova faced away from the court for a few moments before every point… maybe it was to concentrate? It was really enjoyable watching the tennis in the cool winter evening and we’ll probably go again next year. The final is today… I am not too bothered who wins, but I am betting on Serena. Tags: qatar open tennis | Permalink. During January the odometer on my car passed the 1,000km which meant it required its first service. I took it to the large Nissan workshops in the ‘Industrial area’ of the city. This is a huge industrial estate where most of the car dealerships have their service centres plus a load of other buildings for light industrial activities. I got there at 7.30am on a Saturday morning and joined a queue of other Nissan owners. 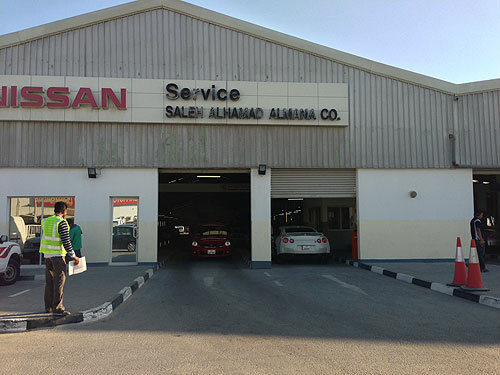 When I got the the front of the line, I was told I was in the Nissan Patrol queue and that Qashqais were services next door. They operate a deli style ticket system, so you get a ticket as you enter the building and wait for your number to come up. 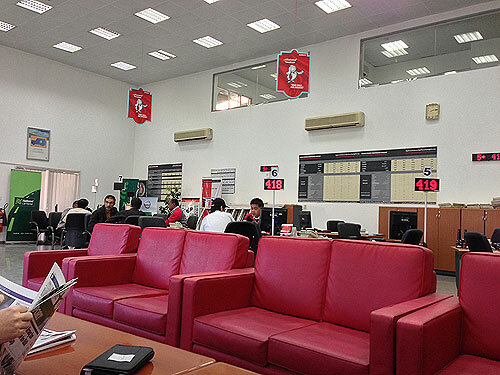 The car was eventually booked in for the ‘while you wait’ oil change and I sat in the large reception area. After about 15 minutes a man with a tray came round offering tea. 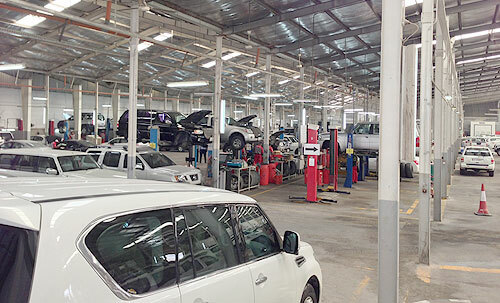 Forty minutes later my car emerged from the huge workshop, cleaned with fresh oil. The next service is due at 5,000km, and every 5,000km thereafter, as the high dust content in the air means that oil and filters need to be changed more frequently than in the UK. When walking along the Corniche in the winter sun, it’s impossible not to look at the water and across the bay. On our Saturday morning walk last weekend we watched the hundreds of small fish threshing around bread that had been thrown in the water. 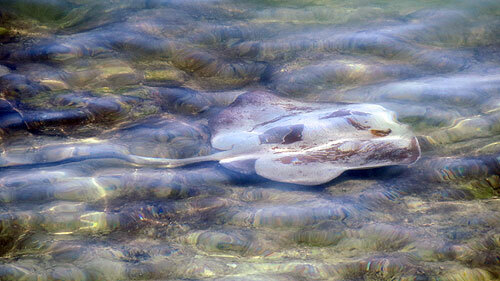 A little further on we came across this ray gliding beneath the shallow water no more than metre from the shore. I have no idea what sort of ray it is… if you recognise it please let me know via the comments box. It was February 2012 when we first came out to Qatar to decide whether Doha was somewhere we could live… clearly the answer was yes. 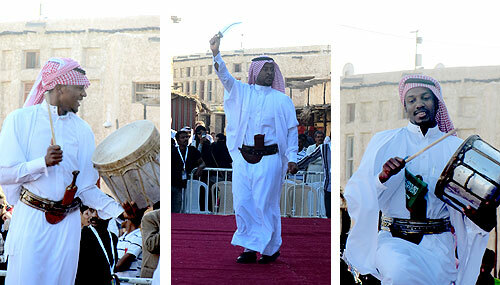 Last February our visit coincided with the Souq Waqif Spring Festival… the 2013 festival started yesterday. During evenings and weekends there are performers out on the street for a seemingly endless stream of entertainment. There are several stages around the Souq and on almost every corner some activity. When we arrived in the late afternoon, the smaller stage had what appeared to be enormous Smurfs singing and dancing… we didn’t stop for long. 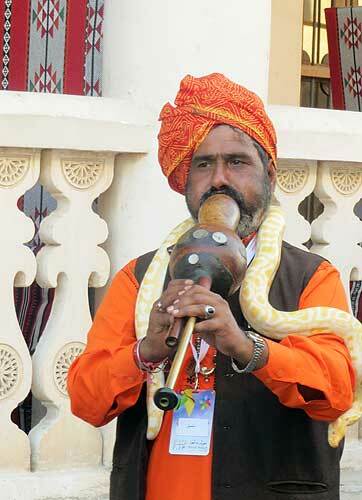 We stopped awhile to watch the snake charmer. The we sat down at the Belgian Café for a cold Lemon with mint and watched as the parade went by. 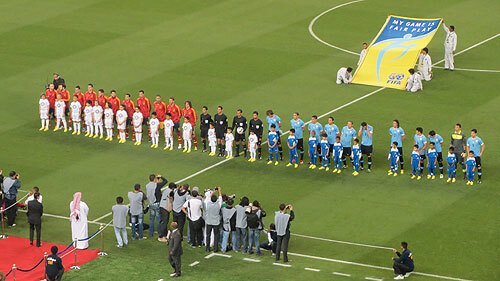 On Thursday we went to a football match. It is the first time I have attended a game for around 15 years. That experience, seated with the Crystal Palace supporters at ‘the Dell’ in Southampton was amongst the least rewarding 90 minutes of my life. The smell of cheap pasties, the uncomfortable seats and the incessant expletive rich invective made it altogether unpleasant… but then it was a birthday treat for a son, so it was grin and bear it. 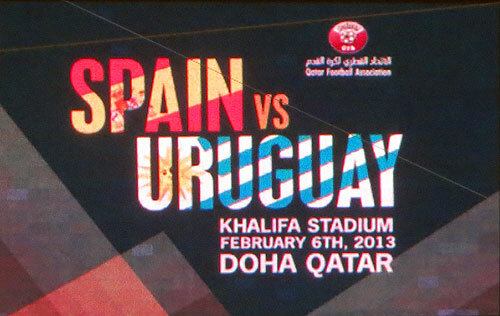 The experience at the Khalifa Stadium in Doha watching Spain against Uraguay in an international friendly was quite different. It was pleasant 20C and not numbing cold. The ticket was 100QR or £17. The family crowd was well behaved. Nobody shouted abuse at the referee. There were 4 goals which I think is the minimum number of times the teams need to score to keep my interest. The 80 minutes passed quickly and enjoyably as we left 10 minutes before the end of the match to avoid the inevitable traffic jams. If I am still here in 2022 then maybe I will go to the World Cup matches.